Many larger transformers have 8 bolt butterfly valves to control the oil flow between the radiator and the main tank. Often there are 8 bolt flanges on the pump assemblies. Gasket deterioration invariably leads to leaks. 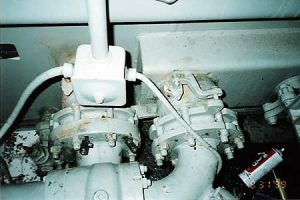 (Figure 1) Like 4-bolt flapper valve failure, to repair the 8 bolt flange gasket normally the radiator bank must be drained and the bank removed and all gaskets replaced on all connecting flanges and valves. Since 8 bolt butterfly valves are associated with large service transformers, down time for a traditional repair is very expensive. As with the 4 bolt flange repair, the TDS repair method is accomplished without draining the oil and can be completed while the transformer is energized if the leaks are located on the bottom connections. If upper leaks are to be repaired, depending on the proximity of the leaking component to high-side, low-side, and neutral bushings, and other energized components, the transformer may have to be de-energized and grounded. To repair the failed gasket, TDS drills and taps 8 holes into the gasket groove around the bolt circle of the flange. 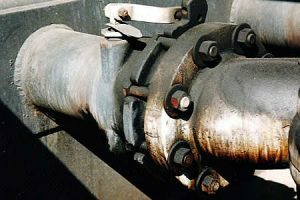 Injection valves are threaded into the holes and sealant is pumped into the failed gasket area using low-pressure hydraulic techniques. (Figure 2) The sealant flows into all the failed areas, thereby fixing the leak. Pipe plugs are placed in the tapped holes after the sealant has cured. Usually an 8-bolt flange can be repaired in three hours.